We radiographed everything except possibly his ears. I did this partially for myself and partially for a baseline in case I decide to market him. Hooves looked good other than that I was right about a slight club foot on the right front. Dang, hate being correct that way. But she said it was mild and probably could be managed with shoeing. Hocks looked clean – yay. Stifles looked clean – yay. Left knee looks good – yay! But there are three ‘howevers’. However, he has an osteochondroma (little bony protrusion) above his knee that may or may not have caused his left front knee to be positive to flexion. If it proves to be the problem, it can be removed for about $1,000 and a week or two recovery time. 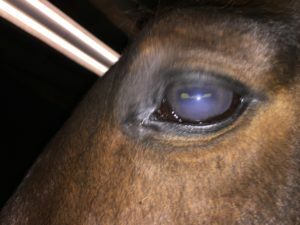 However we don’t know what is going on with his eye, though it appears to be an infection. Ophthalmology is coming to look at it this afternoon. For me, I don’t have to answer that question right now. I’m still waiting on the ophthalmologist. They’ll call me when they get to him. I think I’ll go barn boot shopping here in Ames. Weeeee!